Welcome to the Hub. Log in to deploy TurnKey Redmine in the cloud. Sign up to create a new account in just 60 seconds. 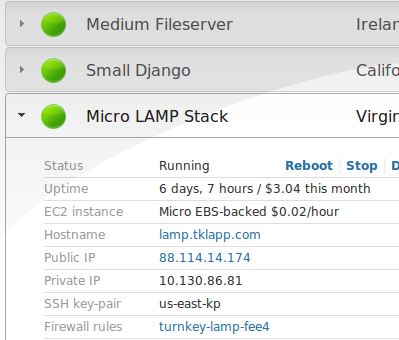 Easy to use: Simple AJAX interface optimized for launching and managing TurnKey appliances on Amazon EC2. Convenient: Launch appliances on-demand with no additional hardware or software required. Nothing to download: Especially useful with larger appliances. Fast: Amazon EC2 is a high performance cloud (up to 10GB/s network connections). Cloud servers: On-demand servers starting at $0.013/hour (1GB RAM) - $9/month if always on. Easy: Fully automated backup and restore. No configuration required. Migrate working systems anywhere in minutes. Powerful: Tracks changes to files, databases, package management and even users and groups. Secure: AES encrypted backup volumes, powered by GnuPG. 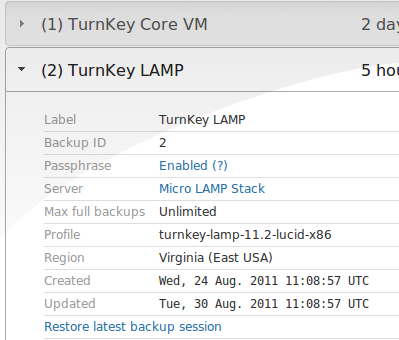 Efficient: Incremental daily backups, full backup every month (by default). Cloud storage: Leverages Amazon S3 for fast, highly-redundant, unlimited storage at $0.03/GB. Turnkey GNU/Linux is a free Debian based library of system images that pre-integrates and polishes the best free software components into secure, easy to use solutions. TurnKey is inspired by a belief in the democratizing power of free software, like science, to promote the progress of a free & humane society. Without the freedom to freely distribute, tinker and learn from free software the Internet as we know it would not exist. Free software is the silent, often invisible power behind the greatest technological marvel of our era. At the time of writing Debian, the largest GNU/Linux distribution has over 37,500 packages in its software repositories. The free software movement has collectively created a treasure trove of software that anyone is free to use, distribute, modify and learn from. Unfortunately, much of this treasure is locked away because too few know about it and even fewer have the skills to take full advantage of it. Imagine how much good we could do if we changed that. That's our vision and we invite you to join the mission. 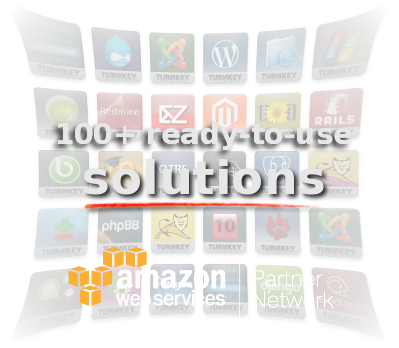 100+ ready-to-use solutions: discover and leverage the best free software. Deploy solutions quickly on bare metal, virtual machines, or in the cloud. Free as in speech: free software with full source code and a powerful build system. Free of hidden backdoors, free from restrictive licensing and free to learn from, modify and distribute. Secure and easy to maintain: auto-updated daily with latest security patches. It just works: designed for ease of use, built and tested collaboratively by the community. Backup and migration: built-in backup software saves changes to files, databases and package management to encrypted storage which servers can be automatically restored from. Assured integrity: solutions are built from verifiably unmodified Debian binaries, except for a few custom components for which full source code is available. Releases are cryptographically signed.